Intel is planning its biggest marketing campaign since the launch of Centrino in 2003 in an attempt to make Ultrabook laptops and tablet-hybrids more attractive to buyers. Speaking at Intel's investor briefing day, Kirk Skaugen, Chipzilla's recent replacement to head its PC Client group, promised 110 reference designs for Ultrabooks by the end of the year. Twenty of those involve systems that can be used as a tablet, either by folding the system or with a detachable screen that doubles as a fondleslab, with one concept model showing a half-sized touch panel built into a laptop shell. Intel has also assigned $300m for the creation of an Ultrabook ecosystem – and this isn’t money going to directly to subsidize the systems but to encourage new and existing companies to develop hardware and software for the platform, with thinner screens a high priority. Chipzilla is also setting up special Ultrabook shopping areas within retail outlets to push the platform. Customers can get a hands-on session with the new systems and presumably get a serious sales pitch as well. The object of the marketing push isn't just to establish Ultrabooks in the minds of consumers and ultimately enterprises, he said, but also to speed up the refresh cycle for existing kit. People generally replace a laptop after four years, but cutting this to three would mean another $35bn in sales to the industry, Skaugen predicted. The price point Intel is aiming for is $699 for a base Ultrabook system, with a premium for touch screen models, although he acknowledged that some Chinese manufacturers using local components had already got below $600 per unit. Next year Intel also expects to see Ultrabooks that offer voice and even gesture control, presumably for a healthy price premium. 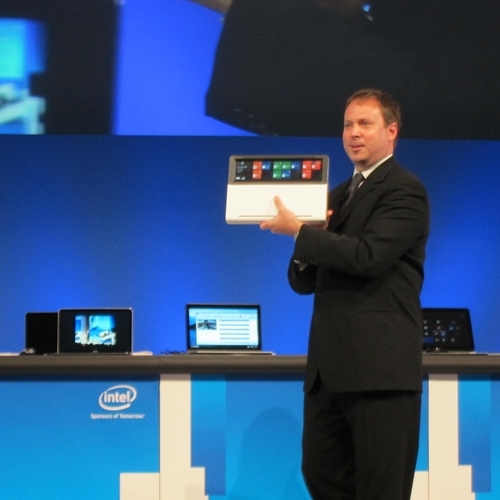 The key differentiator Intel is working for Ultrabooks is size – specifically slimness. The thinnest Ultrabook designs have now gone smaller than 18mm and Intel has redesigned components to fit. Batteries have been reconfigured from cylindrical designs, cutting sizes from 9.5mm to 6.5mm, and the heat sink has been redesigned to be just 6mm high. On the software side, Skaugen demoed two features that will be used to distinguish Ultrabooks from common laptops: RapidStart and SmartConnect. RapidStart cuts the boot time of an Ultrabook from 30 seconds to a couple in the Dell XPS system used in the demo (once the demonstrator figured out where the power button was) by storing data in non-volatile memory. SmartConnect allows a system in sleep mode to update itself with application data like email and social networking so it is up to date on boot, while using minimal power. This system has been designed to work even more efficiently with the Connected Standby function in Windows 8 when it's released in the Autumn, Skaugen promised. Once Redmond has got its new OS out the door, Intel is going to begin marketing Ultrabooks heavily to enterprises, with security and management features aimed at IT managers. An update to vPro that is expected in the next week also plays with Ultrabooks and Skaugen said that security, particularly anti-theft technology, would be a key pitch. Looking ahead, the Haswell processor should be on stream next year and Skaugen promised the improved power and thermal design of the chip would allow an Ultrabook to be left in SmartConnect mode for 10 days without recharging. The extra grunt would also power Intel's plans to add gesture and voice controls to systems using its hardware. All these features will, no doubt, be fed down the value chain into the more traditional laptop ranges, but there's no reason for Intel to hurry.